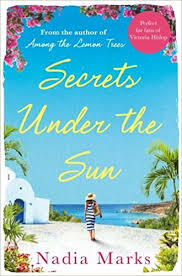 A GLORIOUS LAUNCH OF SECRETS UNDER THE SUN by Nadia Marks at the Hellenic Centre in Marylebone, London – Dorie Simmonds Agency Ltd.
A stunning romantic mystery by the sea, from Nadia Marks, author of the bestselling Among the Lemon Trees. On the island of Cyprus, in the small seaside town of Larnaka, three childhood friends have reunited for the funeral of Katerina, the much-loved old woman who had a profound effect on their lives. Eleni, Marianna and Adonis grew up together, as close as siblings. Although from humble beginnings – a housemaid from the age of thirteen – Katerina’s love, wisdom and guidance helped shape them all. Her loss leaves the friends bereft, but the funeral is not just a time to mourn and remember. Adonis’s mother decides that with Katerina’s death comes the time to share the family’s secrets and answer the riddles of their childhood. A story of deception, forbidden love and undying loyalty unravels. What she reveals will change everything . . .